Seems too complicated? You don’t know where to start? Don’t worry, “Sing Me In” is here to guide you! 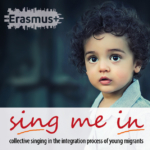 The partners of the project will present the free Handbook “Sing Me in: Singing with groups of young refugees”. It was written for conductors and vocal leaders who want to set up collective singing activities with groups of refugees.